An excerpt from "My OUTRAGEOUS! 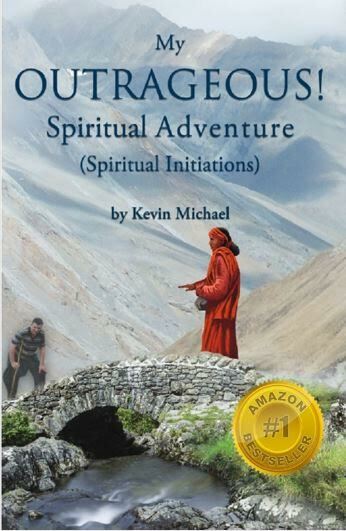 Spiritual Adventure"
… Harry felt nothing at first. Then he remembered to surrender to the prayer. Suddenly, Harry saw in his imagination a high wall, made of bricks, come tumbling down. The rubble was swept away, leaving a clear view of young Harry in a shallow pit. Up on the edge of the pit was a beautiful rainbow-colored Being of Light. Somehow, Harry understood this was Harry himself, who and what he really was. As Harry acknowledged this to himself, the shallow pit rose to the level of the surrounding earth. Suddenly he was face to face with this beautiful Being of Light. Something in Harry’s heart then told him that he was this Being of Light. Harry felt awed by this. “How can this be?” Harry thought to himself. “I’m just a ….” Harry’s thoughts faded as he felt Swami’s presence. “Are you ready to merge with your higher self? asked Swami. Harry sat there with an incredulous look on his face. “Well, I’m, I’m… not sure,” he said, feeling both excited and intimidated at the same time. “What if it does not work for me?” asked Harry. “But what must I do?” asked Harry, both hoping to be able to do it and wondering what it all meant. “Say yes to it,” answered Swami. Harry could feel the simple Truth that this beautiful Being of Light was actually his essence. “How do I say yes?” asked Harry, feeling excited to be so close to such a good thing in his life. “In your inner vision, take a step towards your Presence,” Swami guided, “and he will take a step towards you. Go ahead, take the step,” urged Swami. Harry did as he was told. He took one step toward his Being of Light, and his Being of Light took one step toward Harry. “Now, take another step,” urged Swami. Again, Harry did as Swami suggested. Harry took another step, and this time his Being of Light took another step at exactly the same moment. Harry now felt so close to his Being of Light that he could hardly tell where his edge was. It felt to Harry that they had begun to merge. Harry heard the words “Join with me.” Then Harry heard himself say “Yes” out loud. At this same moment his Being of Light merged with him. It all happened so fast that he did not have time to react. One moment he was plain old Harry; the next moment he was one with his Being of Light. “What just happened?” Harry asked aloud. “You have just merged with your Divine Presence,” came the reply from Swami. “What does this mean?” Harry asked, feeling happy and a bit disoriented at the same time. Swami continued. “Now you have your Divine Essence active within you. Congratulations! You have entered the surest track for your spiritual growth. Much will come to you now that could not come before; your integration with your Divine Presence guarantees it,” Swami finished. “But what does it really mean?” asked Harry. “This is Who You Are,” said Swami. “This is the Divine Presence which is you.